Jenn-Air (Whirlpool) and GE are the two biggest appliance brands in the US. They are, however, very different in how they market their products. General Electric is one of the oldest appliance manufactures in this country. The company was founded in 1907. With production plants all around the world GE has been viewed as a global company diverse in many different products. From nuclear power plants to light bulbs to financial companies GE is a major player in the appliance world as well as the financial world. GE presently is building 16 factories in the United States to create more than 16,000 jobs here in this country. GE is especially strong with builders. To be transparent, we do not sell any GE products at Yale. The Jenn-Air Company was founded by Louis J Jenn in Indianapolis Indiana in 1947. In the early years Jenn-Air focused on the production of industrial fans. In 1961 Jenn-air integrated the industrial fan into a range. The company has since expanded its line of appliances to offer a complete kitchen package. Jenn-Air is part of the Whirlpool family and is viewed as their premium brand. Unlike GE, Jenn-Air is consumer, not builder driven. Before we look at the brands let me describe induction. 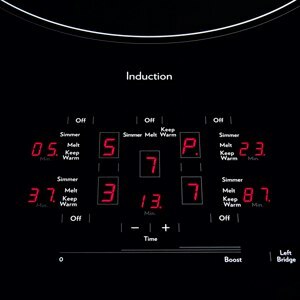 Induction cooking will offer you the highest heat as well as the lowest simmer. 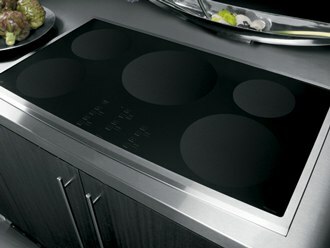 Induction cooktops create a magnetic field which transfers the heat through the pan. The pan actually does the cooking rather than the surface itself. Because it creates a magnetic field to cook with, your pans need to be magnetic. The best way to check if your pans will work is to stick a magnet on the bottom. Now let’s see what the two brands have to offer. Both brands offer a 30 inch as well as a 36 inch induction cook top in stainless steel and black. If you look at the two 30 inch tops you will see they have very similar features and identical wattages. The Jenn-Air does offer you a bridge burner. By connecting the two burners this eliminates the cold spots between the burners where there is no heat. This makes a great cooking surface for griddle cooking. The Jenn-Air cooktop also has a $150.00 rebate which makes it less money. Taking a look at the 36 inch cook tops there is quite a difference. The Jenn-Air cooktop has the largest burner with the most power in the industry. 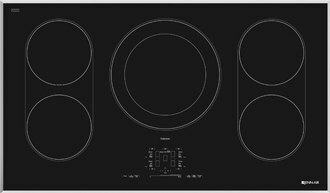 However, the GE cooktop has a 3700 watt as well as a 3200 watt burner. Once again, a big difference between the two cooktops is the bridge burner. The 36 inch Jenn-Air has 2 bridge burners and also has the 12-9 inch high power burner. This allows you to adjust the burner size according to the pan size. These two added features give the cook top more flexibility plus the power of the 5000 watt burner. The 36 inch Jenn-Air is also less money after rebate. 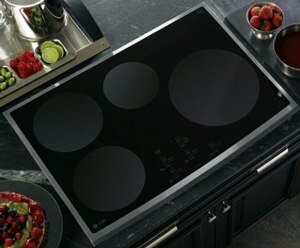 If you would like to see an Induction cooktop, watch this video. 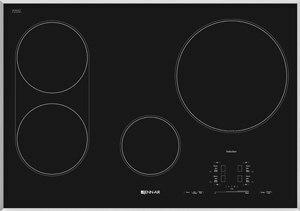 Download our Induction Cooking Buying Guide for up to date features, specs and inside buying tips for every brand on the market. Over 40,000 people have already found answers in a Yale guide.